After the massive success for Oman in hosting the recent Red Bull World Cliff Diving finals, the Red Bull team have been on to me again with something even more wacky than jumping off of a cliff in speedos. This lunatic is going for 4 world records in one with his bid for bragging rights as the world bravest lunatic. If all goes to plan, about 4pm local time here in Oman on Tuesday 9th October, Austrian daredevil Felix Baumgartner is going to ride a hot air balloon up to 120,000 feet (thats 36,576m). Then, the next 2 records will come automatically assuming he jumps.... longest free-fall and free-fall from the highest altitude. And then this guy is going to try and go super-sonic for the final and 4th world record. 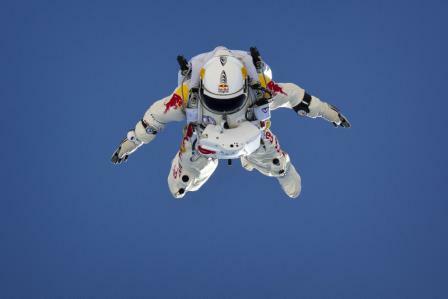 Breaking the sound barrier by way of free-fall. 4pm local time here, but not actually here. No, Oman's Red Bull team have nothing to do with this. None of it will take place in Oman, I think he is just referring to the time you can watch it online.